The Basics of Sales Enablement: What Is It and How Can It Grow My Business? First things first: what are Sales Enablement Services? Sales enablement services are the processes, the content and the technologies used to empower sales teams with a more efficient sales process. The goal is to bring marketing and sales teams together to market more effectively to today’s modern and digital-savvy buyer. The internet has changed the way we do business. A salesperson used to be the way we went about buying things: we, the potential customers, would sit down and chat with them to learn more about their product or service and how it can help us. And while that is still part of the process, it happens a whole lot later than it used to. Today, businesses in virtually every industry use the internet as their way to educate and lead their buyers to them through the process of inbound marketing. Inbound has replaced the old school sales tactics of going door-to-door or making hundreds of phone calls to prospects who have never heard of you before and educating them through those discussions. Now, your prospects already know who you are, and they are likely more willing to have a conversation with someone they already know. But what does this mean for the sales processesof today? It means the process they must go through to close that business has to change, and they need to capitalize on the opportunities the marketing team is presenting by connecting with the prospects who are showing interest in a way that meets their challenges and solves their problems. Now that you know what sales enablement is and why it’s important for today’s marketing and sales processes, you’re probably wondering what all is involved in making a sales enablement happen within your organization. • What is a Marketing Qualified Lead (MQL) for your business? • What is a Sales Qualified Lead (SQL) for your business? • What percentage of the sales pipeline should come from marketing? • How much of the pipeline should come from direct sales activities? Business goals and sales visions are two different things. A goal is a metric that’s easily checked off a list when completed, whereas a sales vision is the state of affairs you want to bring to life. The vision might include a new office location, better benefits or whatever you think you could do on a larger scale if you are successful. In a nutshell, your revenue and growth goals help you fulfill your sales vision for the future. A revenue goal will help you identify if your sales enablement processes are effective. Determining what it is can be challenging at first glance though. To help through this, start with developing a vision that both the marketing and the sales teams can buy into. For example, your vision could be that you want to move to a more modern office space the following year that has room for a ping pong table and BBQ area for employee breaks and lunches. Then, crunch the numbers to find out what your revenue will need to be in order to offset the cost of that move, while also making sure employees and business expenses are paid as well as leaving room for a comfortable profit margin. A few words of caution: Talk to as many employees as possible before defining what the vision is. Sometimes, what a business owner thinks the vision should be can be vastly different than what the entire team collectively thinks about it. Additionally, during the early days of goal setting with sales enablement, you may have to do some guessing as to what your goals will be, but as you continue the process year-over-year, you will have more precise insight into what is realistic and attainable for your organization. In order to have sales enablement success, both your marketing and sales teams have to have a shared understanding and acceptance of how lead qualification works for your organization. Leads that are transferred over to sales that aren’t qualified to turn into an actual opportunities are a waste of time for sales to engage with, interfering with their ability to accomplish the established goals. Sales enablement puts a focus on the pipeline for both the marketing and sales departments, rather than just the number of leads being created by marketing and how many sales were able to close out of that number. A marketing qualified lead, or MQL, is more likely to become a customer as compared to other leads based on lead intelligence and analytics. These can be transferred to sales, but often, these leads will need more time with the marketing information, discussions, and content to become an SQL for the business. A sales qualified lead, or SQL, is a prospect that has been identified by both the sales and the marketing teams to be ready to make a purchasing decision and move to the next stage of the sales process. To begin defining what a SQL is for your specific company, bring sales and marketing together to have a discussion. This discussion should include what qualities and challenges make a prospect a good fit for your product or service as well as which activities make a prospect an ideal sales-ready lead. You should continuously revisit your qualification process and your ideal customer profiles. As the market and your business shifts, continue to tweak and change qualifying factors or details to best represent what a good lead looks like for your business. Now that you know the difference between MQL and SQL and why an ideal customer profile is important, you can identify what leads are Sales Ready and a Good Fit as well as if they are Unready and a Poor Fit. There’s also another area, that’s even better than SQL, and those are hand-raisers. These are people who have specifically asked to talk with a sales representative. Typically, these are strong, sales-ready leads. This chart showcases who should be responsible for each type of lead type. 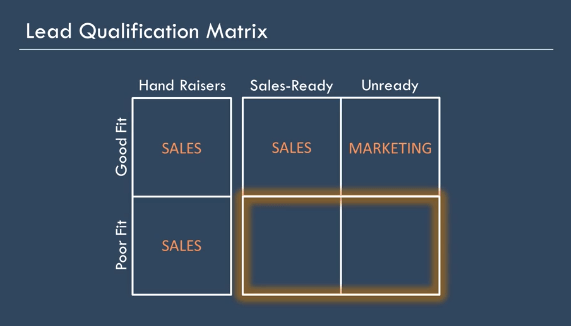 Keep in mind the bottom 2 quadrants should be a low volume of leads. If you have a great deal of leads that fall into those highlighted boxes, you likely need to reevaluate your inbound lead generation strategies. An SLA, or service level agreement, is an agreement between a service provider and a customer that guarantees a certain result. In the context of sales enablement, the SLA between marketing and sales creates joint accountability for both teams so everyone is collectively invested in your unique, company-wide revenue goals. Once you identify these items, you’ll know how many qualified leads you, the marketer, need to get to sales to meet the revenue goals. A key element of the sales enablement process will be to hold regular sales and marketing meetings together to discuss status, processes, and ideas you are utilizing to meet the revenue goals you are collectively working on. These team meetings should be held on a semi-regular basis (at least once a month), and they should be highly productive in nature. Invitations should be sent only to the stakeholders for sales and marketing initiatives that are on the agenda to discuss, so typically top management should not attend these meetings. The agenda shouldn’t devote time to providing accolades or awards; instead, they should be laser-focused on current marketing and sales problems and efforts. Save the high-fives for your quarterly meetings. When conducting these meetings, focus on making a collaborative, creative space. Even if the sales and marketing teams aren’t the best of friends in the organization, the leader of the meeting needs to create an environment where both teams are viewed as equal contributors to the outcomes. A good way to create this environment is allocating equal participation time to each attendee. The buyer personas of your organization should be created and agreed upon with the input of both marketing and sales. Keep in mind that buyer personas are more detailed than a buyer profile: they are semi-fictional representations of your ideal customers. For instance, a great persona may work at the companies that fit in your buyer profile. Buyer personas work to help you identify who are the customers who are both a good fit and sales ready, and who are not. Mary is a Marketing Director in her upper 30’s/early 40’s who totally “gets it” when it comes to what her business needs with regard to marketing efforts. However, she is limited on resources because she’s a one or two person marketing team (with a few contractors here and there) and there’s no chance of that changing anytime soon. She knows her way around HubSpot, but wants to leverage it to its full potential as she understands how critical it is to her goals. Mary does a ton of reading on LinkedIn and online for marketing tools and tricks she can utilize to get the most out of her efforts. Mary wants to work more on combining sales and marketing together to better support the small team of sales reps, but needs to first get the marketing moving more effectively before that can happen. Mary does need the CEO’s buy-in to partner with an agency for inbound assistance, so she’ll have to establish some expected ROI to get the official go ahead. If you’re looking to start creating buyer personas, HubSpot has a great resource available here. Content tells the story the buyers need to know in order to make a purchasing decision. Because of this, it plays one of the most important roles in the sales enablement process. Sales representatives should have content that meets the needs and questions they have during each phase of the buyer’s journey. The marketing team should be creating the content that helps sales reps close business, and if they aren’t, they need to refocus their marketing initiatives. Marketing efforts that aren’t sales-focused are not going to help accomplish your vision or revenue goals. This is the type of content that identifies the problem your customers often encounter, and explains a solution that can solve it. Most often, this includes your product or service as the solution provider. If the content is of high quality and answers all their pre-sale questions, this will ultimately lead the prospects to your sales team for the close. Create this content from the bottom of the funnel up, addressing the main questions your prospects ask first,and work out from there. Keep in mind the more education you can provide to your potential customers during the attract phase only helps further qualify them when they contact a sales representative. The sales team needs access to content they can use while they’re meeting with their leads. This can come in the form of case studies, comparison guides, demo videos, proposal contents and the all important email follow-up content. No matter what type of content, it should always focus on enabling the sales team to provide the most valuable information to the prospect so they are more prepared to make the purchase. The right type of sales enablement technology should allow you to track and measure how your sales enablement processes are working. Tools like HubSpot are built to do just that, provide the visibility to all impacted parties of exactly how well the sales enablement processes are working. Sales and marketing teams should be using the same platforms if they are being held to the same revenue goals outlined. The technology you use helps to keep your processes and efforts in alignment. This post has just scratched the very basic topic of sales enablement. If you’d like to learn more about how you can enable your marketing and sales teams to work together to accomplish revenue goals, click here to schedule a time to meet with us.